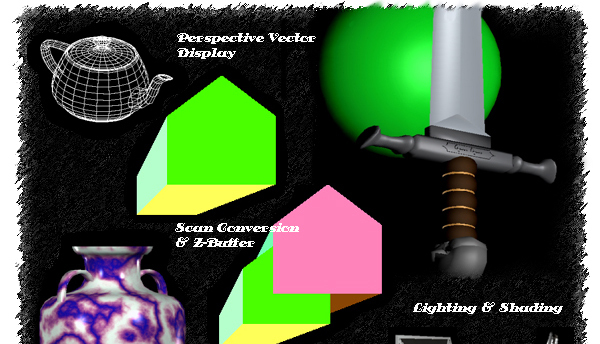 The following courses are offered as a part of the computer graphics curriculum. Undergraduate computer science BS students interested in Computer Graphics and Animation may take CSCI 4551 as a Upper Level CS course required in the 4th semester and could take additional courses of CSCI 4552 and 4553 as Unrestricted Electives. Graduate students may not take 4551, 4552, or 4553 for graduate credit. For more information on the degree programs please go to Department of Computer Science. Principles, techniques, and design of computer games. Graphics game engines, modeling, motion, AI, and interaction. Sound design and synthesis. Real-time software and hardware issues. Social and psychological issues. Business of game development. Projects in developing games. Guest lecturers from industry who specialize in game development will augment an interdisciplinary group of lecturers. May be taken for graduate credit. (Fall) Prerequisite: CSCI 4554 or permission of instructor.